ANY TIMES in the past I have talked about the following phenomenon: one notices a word or person and then within 24 hours one finds that same word or person mentioned in a completely random, surprising place. I’ve also said that I will not blog on this topic anymore, since readers are probably sick of hearing about it. That doesn’t mean I’m not tempted . . . this phenomenon happens so frequently. For instance, the self-same day I happened to research Cardinal Ottaviani, a friend of mine posted the picture in the upper right hand corner. Odd, is it not? 1. 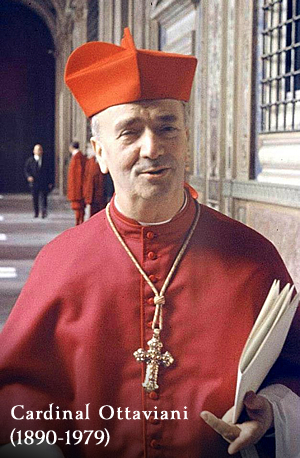 He was made a Cardinal before being consecrated a bishop, which is rarely done these days. 2. He had a triple doctorate, just like Fr. Adrian Fortescue. 3. He was blind later in life (similar to how Beethoven and Fauré were deaf later in life, but that’s another story!). Over the course of my life, I’ve often read about Cardinal Ottaviani, but I am certainly no expert. I will mention just a few more things before I bring this blog to a close. Someone has written that as a young Peritus at the Council, Ratzinger acted as “one of the theological young Turks leading the charge against the status quo Ottaviani emodied . . . Ratzinger was among the behind-the-scenes plotters who ensured theat the council foiled Ottaviani on virtually every issue.” This may or may not be the case. Probably, young Ratzinger had some problems and issues with the Curia Romana. That’s ironic, because people “in the know” have told me Benedict had to resign as Pope because he no longer had the strength to fight against the out of control Curia Romana. In any event, perhaps we’ll know someday, if a true historian writes a biography of Ottaviani. Unfortunately, really good historians who actually know something are rather short in supply these days, and that’s a fact.